Embrace change this autumn as the cooler weather brings the chance to wear classic prints. Try warmer fabrics like wool and flannel in a choice of checked fabrics. Plaid patterns including tartan and tweed are perfect for adding heritage chic to your wardrobe. Wear with simple separates or clash your prints for a confident look. Mix checks with flowers, especially when you’re dressing to impress. Tailored checked suits look great with a bright floral shirt or tie. Some blazers are lined with flowery fabric if you want a subtler way to embrace botanical blooms. Or try a floral or paisley pocket square for a nod to the trend. Stripes are another perennial favourite for print fans. Instead of opting for stripy socks to display your fun side, why not try a striped tie? Lined jumpers and knits are also a great way to earn your fashion stripes. For a sporty look try side stripes on your joggers or choose gingham accessories for a wardrobe refresh. 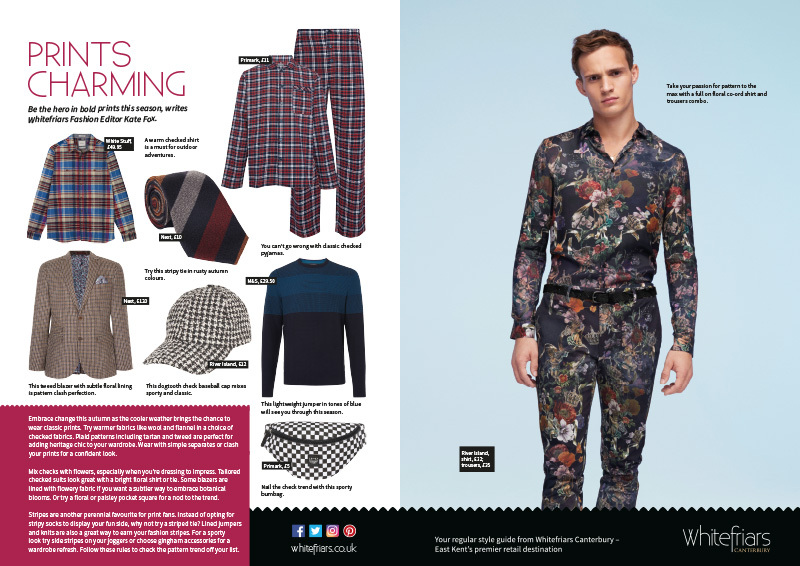 Follow these rules to check the pattern trend off your list.